Sometimes it's very easy to focus entirely on the technical aspect of your website. Becoming obsessed with search rankings and META details is probably not a very stable mental state... It's good once in a while to step back and consider the fact that your site is predominantly targeted at human beings, not search bots. If your site is technically brilliant and visually unappealing there's a risk that your potential customers will go elsewhere. People have a very limited attention span, after all. A recent example has been the addition of a few 'bells & whistles' to the NARPO site. 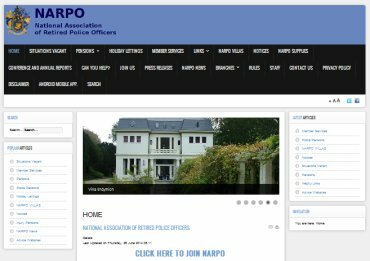 NARPO is The Nation Association Of Retired Police Officers and their site if very much information based, dealing with pension issues and various other matters which are of interest to it's member. Previously it had a very heavy text content with very few images. We added an image slider to the index page, a search module, popular articles and latest articles modules. There's nothing ground breaking here, comparatively it's still a relatively simple site. However the server statistics had an interesting tale to tell. From an average visitor count per day of 681 the number of visitors increased to 1012 the day after this minor update and are presently 1423 on average per day. The average duration of each visit was previously just over 4 minutes and is now over 23 minutes. I'm quite certain that the update has not doubled the membership of the association and to ensure that these figures are as unbiased as possible the daily visitors only includes those who move from the index page to other areas of the site. This reveals the devil behind the detail, as it were. These members were most probably hitting the site previously but found it uninteresting and simply left. Now site visitors are staying on the site for 4 times as long and most probably finding information of which they were previously unaware. This has to be a good thing for both the members and the association as a whole.